I've been spe nding a bit of quality time with the blast cabinet and the spray can. 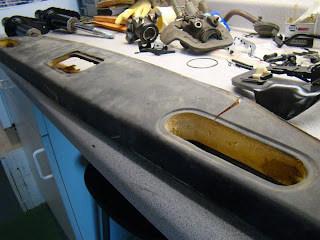 Just about every surface on, in and under this car needs refurbishment. I recently re-did the front suspension, brake calipers and dash. As it turns out, the guys at Oregon Axle had just enough parts to do our CV shafts. Three of the four joints were pretty much destroyed, so they completely replaced those, and cleaned, lubed and re-booted the fourth. I've also been pretty concerned about what to do for struts. As luck would have it, once disassembled and blasted, I discovered I had a pair of Tokico struts that are actually in pretty good shape. N ow freshly painted and reassembled, they look brand new! I've turned my attention to the dash, which will need to go in before I can even think about the day we fire this baby up. I've had a pretty good time bringing the dash back to life. Naturally, after a lifetime of exposure to the sun's life-giving radiation, the dash pad was cracked and discolored. Vic at Chuck's Upholstery, here in Corvallis, recovered the pad with a thin, pliable vinyl used for ATV seats. Between our impending need for a headliner, door panels and original looking vinyl seats, I see a lot of work in Vic's future. After I had cleaned the rest of the dash, repainted the forward trim piece and re-affixed the VIN plate, I reinstalled the pad. I also hand-painted the raised lettering and border with the touch-up paint from Carley's '04 Accord. 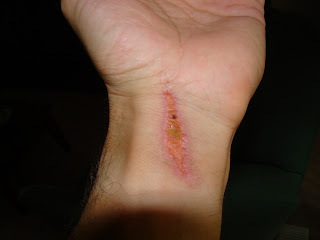 While taking the paint off of a dash piece, I discovered that if one intends to commit suicide, I do NOT recommend using an angle grinder to slash one's wrists. 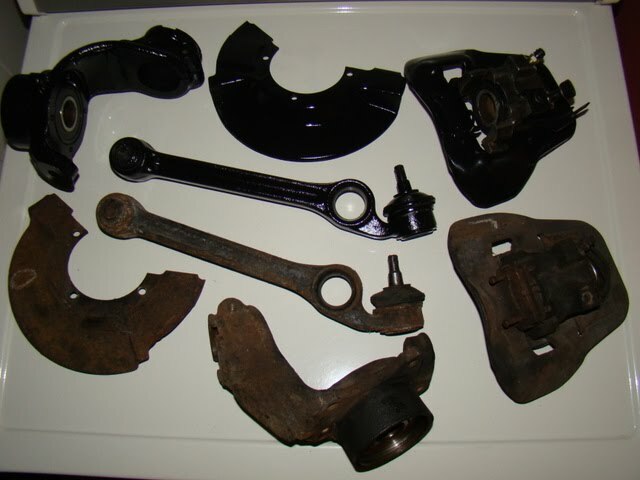 I got the shifter disassembled and painted, which was a challenge as it was not made to be taken apart. Now I need to concentrate on pedals, wiring and cables for clutch, choke and whatever else presents itself. My dad will be back next weekend to lend a hand. I need to try to get as much of this accomplished as I can so I can make good use of his talents . I got a carb kit for a '75 Honda Goldwing, which apparently has a number of usable parts. No one actually makes a kit for this car, so this is what people use to rebuild the carbs. Mike O'Connor (the guy who built our engine) let me know these have a tendency to have trouble with accelerator pump diaphragms drying out and going bad. Of course this part is also unavailable, but he happens to have a guy who makes them for him, so he sent me one. Heck of a guy.